NAIROBI, Kenya, Feb 16 2018 (IPS) - Sexual abuse allegations against Oxfam staff, and failings in the charity’s response to them, delivered a body blow to an organisation renowned for years of humanitarian and development work. At the very least the accusations will leave a stain on the reputation of a charity that works in some of the toughest environments in the world, and has made a positive difference in the lives of the most vulnerable. The Oxfam reports come in the wake of a wave of revelations of sexual misconduct that spans churches to faith based organizations to children being abused in orphanages and schools in some of the most developed countries in the world. What started as a Weinstein story in Hollywood, has spread to become an almost-daily parade of politicians, CEOs and celebrities facing allegations, sexual and gender-based exploitation, harassment and violence is a global issue. It is a crisis on an epic scale. Under the hashtag #MeToo, thousands of women who had long bottled-up their pain have come forward with their stories, lifting the lid on decades of simmering frustration and repression. But there is nothing new about the sexual abuse and exploitation of women. The Oxfam scandal is an unfortunate blight. Organisations in similar circumstances must be transparent about how they punish culprits and what remedial and preventive actions they have taken. Justice must be unrelenting and exemplary, in pursuit of individuals who commit such acts, regardless of their rank or station. The guilty must go to jail in the country they commit such an offence. Sadly, throughout history women have been raped or sexually exploited by armed combatants. But even where force is not used, women in conflict or post-conflict environments often live in poverty, and the power imbalance between them and humanitarian workers or peacekeepers has often led to ugly sexual transactions in return for basic necessities. When the United Nations (UN) faced similar scandals, the organization quickly resorted to policies and procedures around sexual harassment. The UN Secretary-General is obliged to regularly report to the UN Security Council on the issue of women and peace and security. Another resolution reinforced the Secretary-General’s authority to repatriate and replace peacekeepers accused of sexual exploitation. 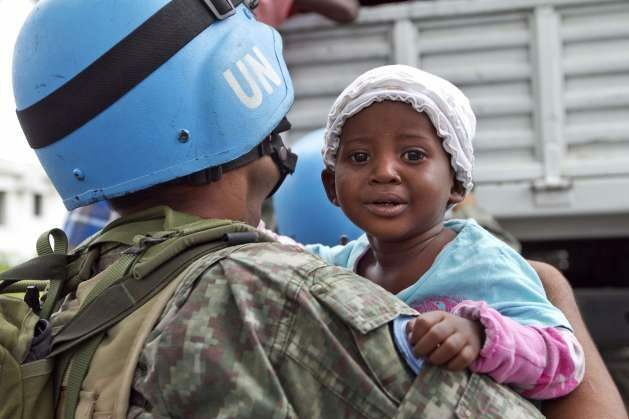 Last year, 600 peacekeepers from the Republic of Congo were repatriated from CAR as a consequence. While calling for solidarity in condemnation of sexual exploitation and abuse, United Nations Secretary-General António Guterres has said that the UN will not “let anyone cover up these crimes with the UN flag. … Let us make zero tolerance a reality”. But it is time to look beyond policies and procedures. It is time for a candid look in the mirror and for society to make an overdue cultural shift on what has often been considered normal. The fact is that perpetrators are aware of the line between appropriate and inappropriate behaviour, but in most cases they just do not think it is as ‘a big deal’. After all, while much of gender inequality is institutionalised in social, economic and political structures, it is individual men and boys who exploit, intimidate, harass and assault women and girls. Deeply embedded cultures have continued to revere men in power and to protect them from facing consequences of their actions, even when they know that those actions cross the boundaries of decent behaviour. We have let authority, money and influence bestow on men the right to treat women as lesser beings. Evidence abounds that misogyny and society’s structure continue to give men carte blanche to diminish women. Power and masculinity are tightly knit and sexualized, and find expression in sexual impunity or entitlement. A comprehensive cultural shift must go beyond sexual abuse, and upend other expressions of patriarchy such as early marriage, female genital mutilation, and denial of sexual and reproductive healthcare. It is time to create gender parity in management positions to halt the patriarchal notion that power is generally a masculine characteristic. The Oxfam scandal is an unfortunate blight. Organisations in similar circumstances must be transparent about how they punish culprits and what remedial and preventive actions they have taken. Justice must be unrelenting and exemplary, in pursuit of individuals who commit such acts, regardless of their rank or station. The guilty must go to jail in the country they commit such an offence. This must be seen as an opportunity to enforce zero tolerance to sexual harassment and to create a culture in which women are no longer seen as the sexually available yet socially invisible half of humanity.